Inspiration for this blog post came from an unlikely source: My brother’s high school homework assignment. For his film class he had to write a paper about House of Wax (the 1953 version, not the disastrous Paris Hilton remake). While proof-reading his paper (yeah, I’m a good sis like that), I learned that House of Wax was the first 3-D color feature from a major American studio. It premiered just two days after Man in the Dark, the first 3-D film released by a major studio. Together, these films sparked a 3-dimensional craze in the early 1950s. It was the studio’s way of competing with the new threat of television. Sound familiar? Cut to over 55 years later and the gimmick is booming once again. This time, it’s to compete with the threat of the dreaded Internet. (Wolverine leak, anyone?) 3-D has been a go-to trick studios will use in order to get more seats in the theater. And, hey, as cheesy as it is, it works. Let’s count the recent number of 3-D films, shall we? There was Journey to the Center of the Earth, Coraline, Monsters vs. Aliens, Hannah Montana & Miley Cyrus: Best of Both Worlds Concert Tour and My Bloody Valentine 3-D, to name a few. And then there are the 3-D films yet to be released: Disney Pixar’s Up, Final Destination 4: Death Trip, Ice Age: Dawn of the Dinosaurs and Avatar. Who knew this silly experiment from the ‘50s would turn a profit decades later? 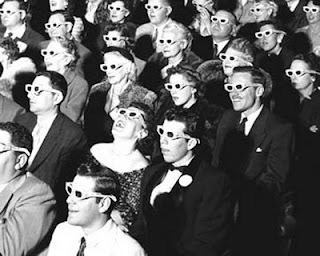 You can thank House of Wax for those goofy glasses, and for bringing movies of today to new depths.